There are numerous reasons for this. Wearing dentures continuously can cause irritation to the gums, cheeks, lips, tongue, and can contribute to jawbone loss and tissue sores. Removing dentures at night allows for your oral tissues to breathe and heal. Additionally, wearing dentures overnight can cause the buildup of viral bacteria, which can lead to a wide variety of issues. When you’re not using your dentures, it is important to keep them moist by soaking them in water. If dentures become too dry they can lose their shape. Therefore, try and store them overnight in a denture soaking solution to keep them sanitized. This will get rid of any bacteria buildup. Make sure to also rinse and clean your dentures after every meal. A light scrub with soap or dishwashing solution will work great. Make sure to be gentle and not to over scrub! It is important to wash your dentures daily and after every meal, however, you should avoid using strong cleaners or harsh toothpastes. Using brushes with stiff bristles will also harm your dentures. These products are way too abrasive, and can cause damage. Gently rubbing your dentures with a brush or a soft bristled brush and soap is the best option. Make sure to also rinse thoroughly after cleaning, and always brush your gums and mouth before putting them back in. 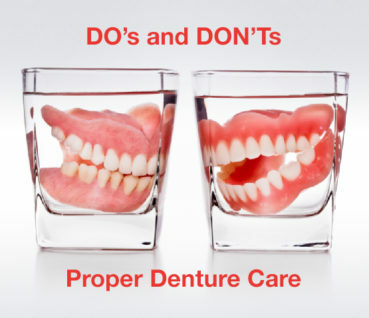 For more information or tips on how to take care of your dentures, please do not hesitate to contact us! Our Calgary mobile denturist would be happy to assist.